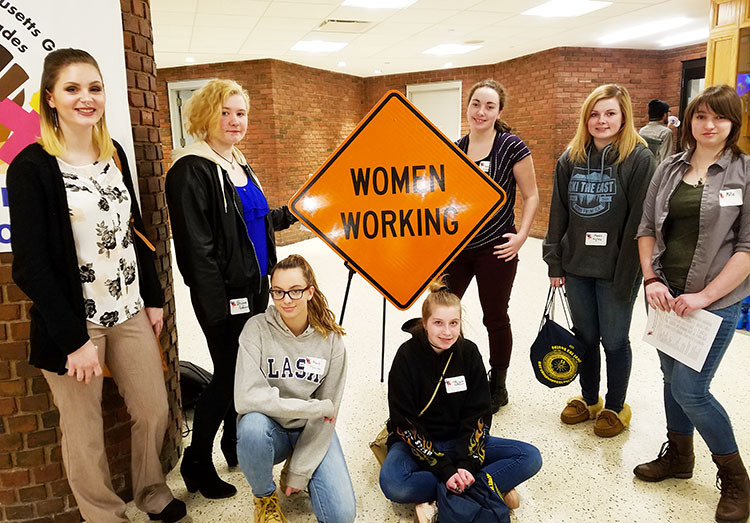 Thirteen Tri-County students in grades 10, 11 and 12 from the carpentry, metal fabrication, electrical, and HVAC and R programs attended the 2018 Massachusetts Girls in Trades Conference and Career Fair at the International Brotherhood of Electrical Workers (IBEW) Local 103, Dorchester, MA. The event was attended by over 500 young women from 27 vocational high schools throughout eastern Massachusetts along with Lt. Governor Karen Polito. The conference is intended to support and encourage female career and technical education students and alumni to pursue careers in the skilled trades. Tri-County students engaged in learning about apprenticeship training programs, met tradeswomen working in the field, and learned how they, as high school girls in trades programs, can leverage the increase in building projects and seek opportunities for high-paying careers in the construction industry. Building Trades Unions, Apprenticeships, Contractors and Community Organizations who were part of Girls in Trades Massachusetts Conference and Career Fair shared information with students in anticipating that many of them will come and join them after graduation.